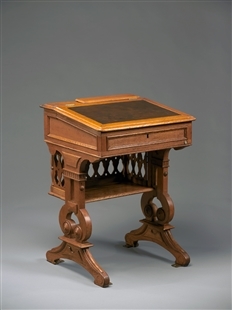 This desk type was the last style to be designed for the House Chamber. 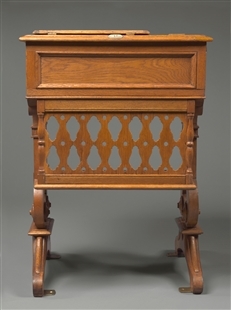 Introduced in 1873, the so-called Klipper desks—nicknamed for their manufacturing firm—were more compact and less flamboyantly Victorian than the 1857 models that they replaced. 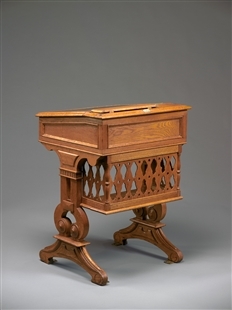 Sparely adorned, these desks served as Member’s Chamber workspace until 1901 when space for 34 more seats was needed. 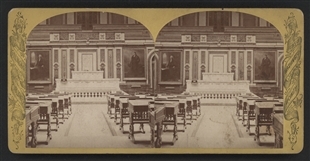 Later, desks were simply no longer necessary; as of 1909, every Member had designated office space in the House Office Building, now called the Cannon House Office Building.